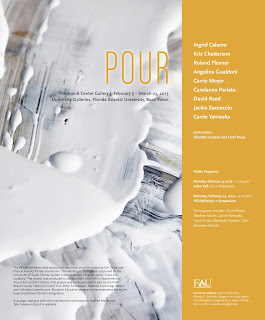 Pour opens in Boca Raton, FL, February 5 - March 23, 2013. 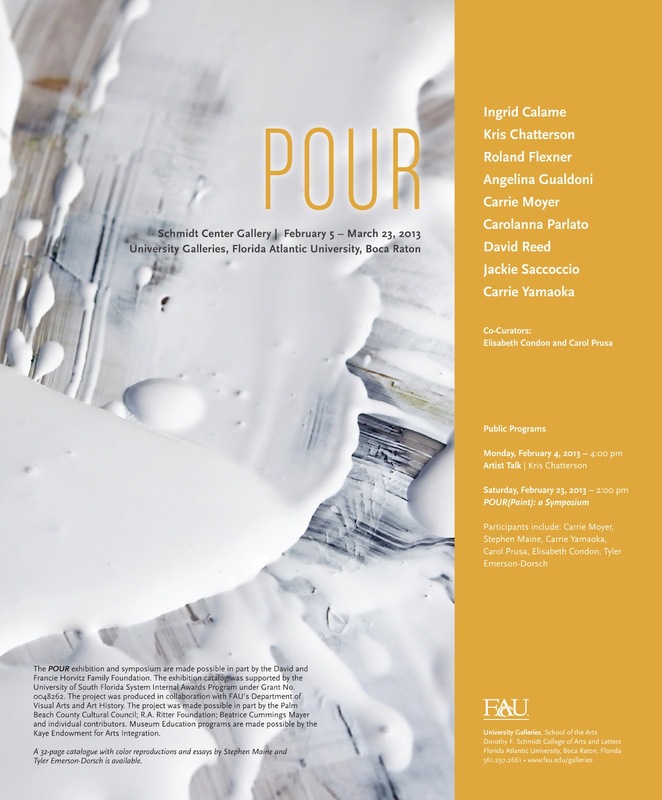 Pour comes to New York in April 2013, opening at Lesley Heller Workspace and Asya Geisberg Gallery April 24 and 25 through May 24, 2013 respectively. A catalog with essays by Stephen Maine and Tyler Emerson-Dorsch is available. 2012 brought several major projects to fruition, including Seven Seas (just closed) and opening soon, Pour, an exhibition featuring nine artists who pour paint. Pour features the work of Roland Flexner, Carolanna Parlato, David Reed, Ingrid Calame, Jackie Saccoccio, Kris Chatterson, Angelina Gualdoni, Carrie Yamaoka and Carrie Moyer. Click the link to Florida Atlantic University's Schmidt Galleries, where the show opens February 4 - March 18 before traveling to Lesley Heller Workspace on the Lower East Side and Asya Geisberg Gallery in Chelsea April 24-25, 2013. Scott Draft made a trailer for the exhibition. A catalog accompanies the exhibition with essays by Stephen Maine and Tyler Emerson-Dorsch and a statement by each artist about the role pouring plays in their work. As I write, the work is en route to FAU. I look forward to next week's installation. Postscript: the solo exhibition Seven Seas comprised a visual foray into adolescent memories of Rodney Bingenheimer's English Disco, 7561 Sunset Blvd (extant 1972-1974). Rodney's apprenticeship at A&M Records acquainted him with the young David Bowie, who advised Rodney to open a club in LA featuring the glam rock sweeping the British music scene. High British tax rates and LA's sunny climes beckoned rock stars the world over. The paintings in this show, fueled by spray-painted drywall, mirrored dance floors, the Runaways and later, X, are inspired by Rodney, who continues to dj at KROQ, and the club that opened my world to alternative culture forever.